Faber Acoustical is pleased to announce the immediate availability of RoomScope for iOS on the App Store. RoomScope both measures and analyzes room impulse responses, calculating acoustical parameters such as reverberation time, early decay time, clarity and definition. Room acoustics parameters may even be calculated and displayed in whole or 1/3 octave frequency bands. 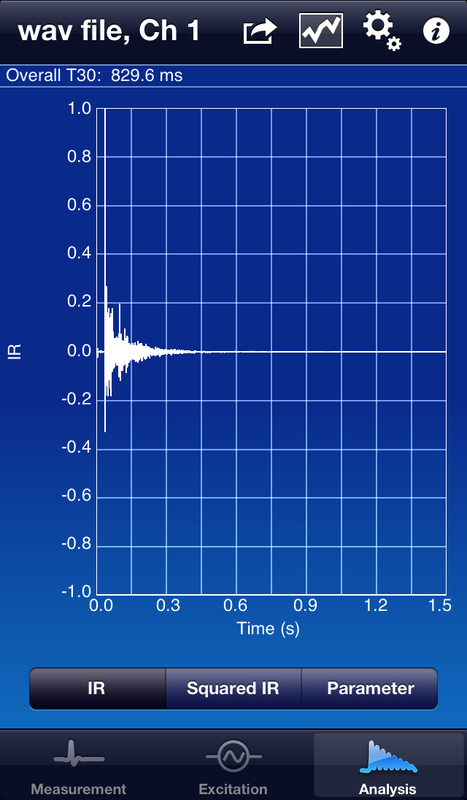 RoomScope offers users the ability to measure the acoustic response of a room, while viewing the impulse response, frequency response, or coherence dynamically as the measurement progresses. 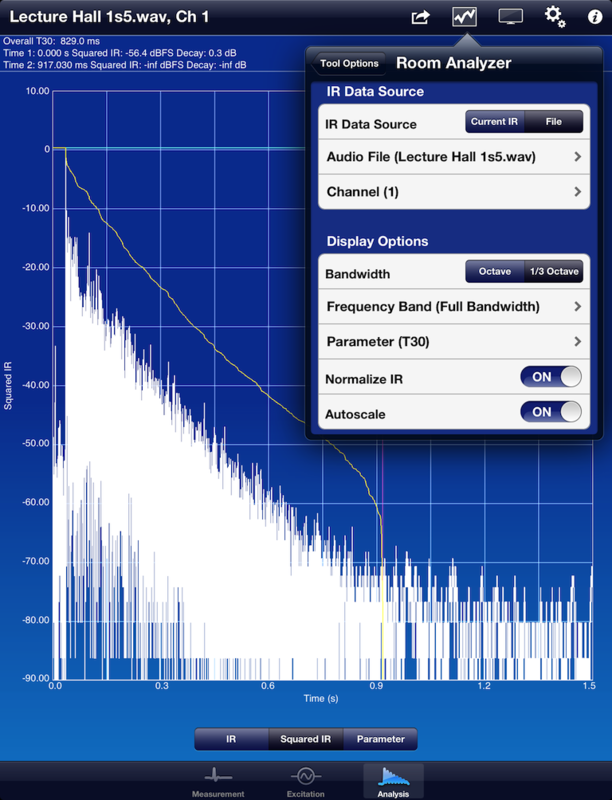 RoomScope’s dual-channel measurement capability enables users to employ built-in frequency sweeps or pseudorandom noise as a reference, or to work with arbitrary test signals from another source. Room parameters, which are calculated by RoomScope using the integrated impulse response method of the ISO 3382 standard, include reverberation time (T20, T30, T60), early decay time, clarity (C50, C80, Cte), and definition (D50, D80, Dte). Users can use dual cursors within the plot of the squared impulse response to dynamically set integration limits for the decay curve. 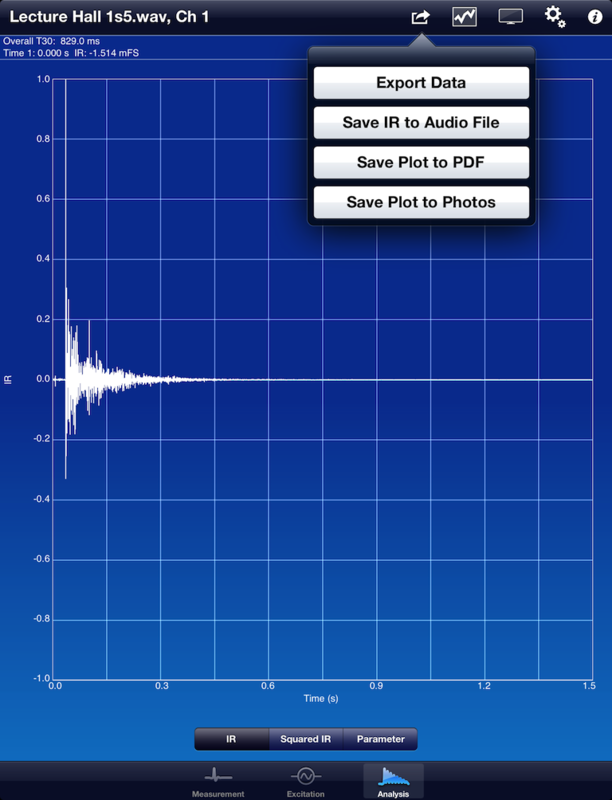 Measurement data and calculated acoustic parameters may be exported to CSV, TXT, or MAT files. Impulse response data may also be stored in AIF, CAF, or WAV audio files. 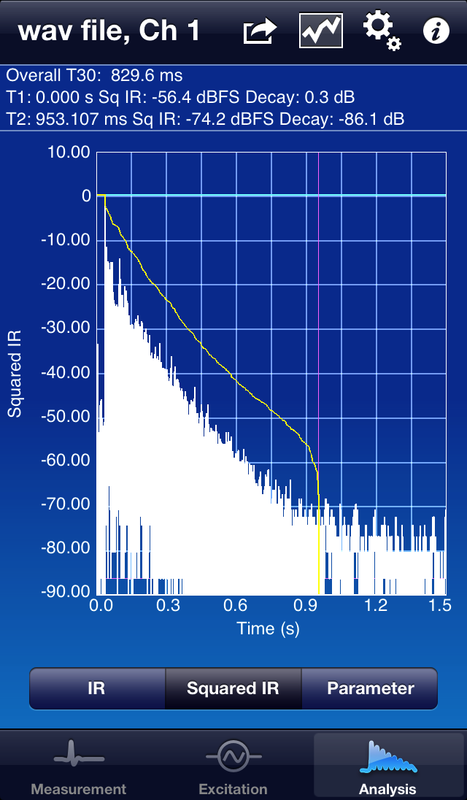 RoomScope additionally supports loading impulse response data via audio files created or opened in other apps, such as SignalScope Pro. « Are you looking for a measurement microphone for your iPhone? This looks like a very interesting app for us acoustic consultants. Can the app measure using an impulse like popping a balloon? Is it possible to calculate the average over several measuring points in the same room? RoomScope does not currently capture impulses directly, as in the example of balloon pops. However, you could capture triggered impulsive sounds using SignalScope Pro and save those captured impulses as AIF, CAF, or WAV audio files that can be loaded into RoomScope. Direct impulse captures (and averaging of those captures) may be added to RoomScope in a future update, but I can’t currently say when that might happen. 1.) is it possible do get a morte detailed description please? 2.) that room pulse is it generated by RoomScope? 3.) is a special microphone necessary?